​Anne Hytta has written music for quartet Tokso inspired by the Norse 1000 year old creation myth Voluspá. 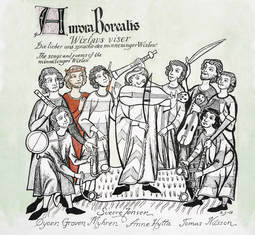 ​The Oslo based medieval music ensemble Aurora Borealis releases their second CD in September 2018 with the songs written down by Minnesänger Vizlaw Von Rügen. This is the first time his 13th century songs are recorded altogether. ​The improv contemporary jazz trio Parallax join forces with the hardanger fiddles of Hytta on this release, where soundscapes from two worlds meet. 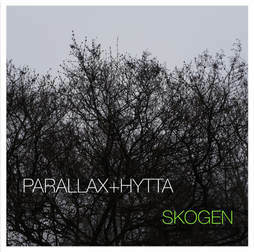 Parallax and Hytta have worked on this music for a couple of years, and recorded the album at Østmarka kapell in the forest of Oslo three days in October. 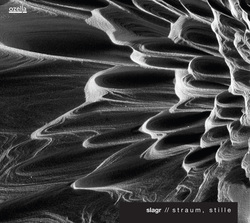 ​The meditative music of Slagr provides a portal for the imagination to roam free: a magical sound-world whose melodies and drones combine with an audio-palette of austere yet beautiful instrumental textures to provoke an infinite sense of openness capable of conveying a myriad of meanings. 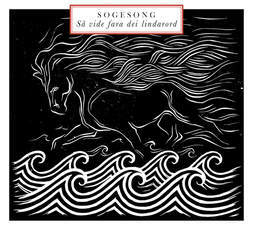 ​Medieval music from Telemark: Two of Norway’s foremost folk musicians, Øyonn Groven Myhren and Anne Hytta, have joined forces to form the duo Sogesong and to release a recording offering brand-new, fresh and original interpretations of old folk songs that were well hidden, but not entirely forgotten. ‘A few years ago we began to explore the treasure trove of ballads from Telemark together. The unusual melodies and fantastic narratives spoke to us. We have awoken them from their slumber on lifeless pieces of paper, and have sung and played these well-hidden medieval folk-tale songs until they gradually acquired a life of their own that we think suits them,’ Øyonn and Anne tell us. The album was nominated for Spellemannprisen, the Norwegian Grammy, in the category of traditional music. An album of hardanger fiddle tunes from Telemark in four harmonies. ​"Tune playing. A tangle of filigree from which one can never unwrap oneself, nor indeed would wish to. Playing never came easily to me – yet, with time, music emerged." Strimur received Spellemannprisen, the Norwegian Grammy, in the category of traditional music. The music of trio Kaldestad is composed by singer and percussionist Gyrid Nordal Kaldestad. Anne Hytta plays hardanger fiddle, and Are Lothe Kolbeinsen plays guitar. Their music is melancolic songs wrapped in a dreamy, poetic soundscape. The album is released on label Atterklang. The album and the ensemble OffRoad is based on the music comissioned by Global Oslo Music, to celebrate their five year anniversary in 2013. In this context West African guitarist and singer Becaye Aw composes an untraditional mosaic of voices and instruments where notes and rythms are a central theme. By creating cohesion from a variety of forms of expression, while also allowing room for what makes each and every one of them special, the composer seeks to create an original sound. Becaye is collaborating with the musicians Anne Hytta, Sigrun Eng, Liv Ulvik, Torgeir Vassvik and Kossa Diomande, with Malika Makouf Rasmussen producing. The Offroad ensemble currently consists of Becaye Aw, Liv Ulvik, Anne Hytta and Sigrun Eng. The inspiration for short stories came from a story by Norwegian author Hans Herbjørnsrud: „On an old farmstead in Europe“. The protagonist of the story finds a skull on a field near his farmhouse one day. Through the skull and the story linked to it, he becomes aware of the continuity of earthly existence. 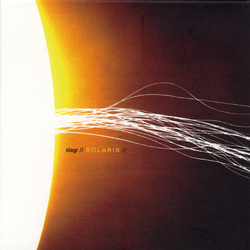 Slagr won a Grammy (Spellemannprisen) for album of ​the year in the open category for the album. When the 4 Tokso ladies from 3 different parts of Europe come together and unite their sounds, no less than 53 strings start vibrating in intense interaction! It was true love from their first bow stroke on the strings, the tones sparked in the air and hit the walls from all angles. They instantly knew that this was music that needed to be heard by the people! 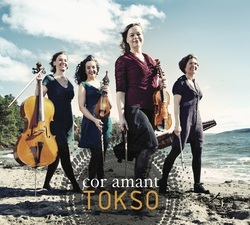 The unconventional string quartet, with Cretan Lyra, Swedish Nyckelharpa, Norwegian Hardanger fiddle and Cello, hereby present their new album Cor Amant. The solo release Draumsyn on German label Carpe Diem Records sees the sounds of the distinctive Norwegian hardanger fiddle being brought into new and mesmerizing landscapes. 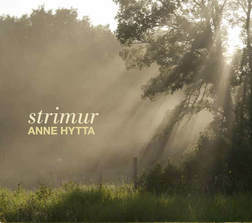 Strangely beautiful at one moment and heartbreakingly raw at the next – this may be descriptions of the music on Draumsyn, a solo album containing new compositions performed by Norwegian hardanger fiddler Anne Hytta. Draumsyn, initially a Norwegian and Islandic word meaning dream vision, finds inspiration in the hypnotizing rhythmic pulse so typical for the traditional repertoire of the hardanger fiddle, but more than anything the music is patient meditation over musical stills. Buy the CD or LP here. Balochi folk music is very much a living, dynamic music form, and is used on all kinds of occasions. Demonstration of this aspect was primary for Padik, when the group entered into this recording project. Padik's intent is to convey the musical vitality that is inherent in Balochi repertoire. 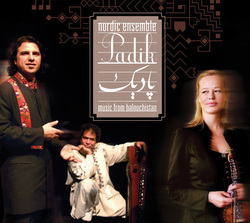 In blending with traditional Scandinavian folk music, Padik continues the Balochi openness and curiosity about other traditions. When Anne's Hardanger fiddle playing is woven into Balochi music, the resulting sound is not "cross-over", but traditional Balochi with a delightful, slightly exotic twist. Slagr's release Songs by Geirr Tveitt is paying homage to the musical legacy of one of the most renowned Norwegian composers of the 20th century with tender sounds and transparent textures. 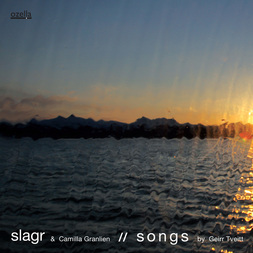 Supported by folk singer Camilla Granlien, Anne Hytta (Hardanger fiddle), Sigrun Eng (cello) and Amund Sjølie Sveen (vibraphone, tuned glasses) are effortlessly connecting the worlds of classical music, folk and improvisation - just like Geir Tveitt once did, when composing his little masterpieces. The music of Norwegian pianist Andreas Ulvo commutes naturally between the worlds of modern jazz, contemporary classical music and Norwegian folk music. All these musical universes are melted organically to his collaboration with Norwegian contemporary folk music ensemble Slagr. The aptly titled Softspeaker describes beautifully this collaborative effort. Ulvo's calm, highly melodic and reserved piano playing has much in common with the warm, trance-like ambiances of the Slagr trio The ensemble's unique interplay creates light, evocative and chamber-like soundscapes, each with profound emotional impact. 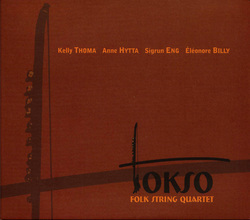 Tokso is an ensemble consisting of four musicians from Norway, Greece and France playing folk instruments with sympathetic strings. Their repertoire consists exclusively of their own compositions performed with virtuosity and musicality, accenting the freshness of new creation and the freedom of innovation. They make extended use of improvisation as well as of various techniques inspired by the traditions from which they come from, as well as utilizing techniques of their own invention. 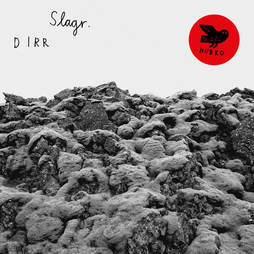 On Slagr's striking second album, tradition and modernity are entering into a darkly beguiling liaison. Eschewing obvious quotes or cliched references, the minimalist chamberfolk trio from Oslo blend the brittle, drily poetic string stirrings of Norwegian tradition with the nocturnal eroticism of Jazz, the rhythmical patterns of Steve Reich and the sparse canvases of Morton Feldman. 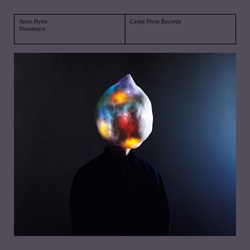 Pieces evolve slowly and almost imperceptibly, as part of a deep and trance- like process, the band carefully and slowly arrive at a resonant, sonorous continuum of sounds that is as concise as it is poetic. Buy the CD on iTunes or here. Dei Beste Damene is a collaboration between three of Norway’s leading Hardanger fiddlers. Åse Teigland, Synnøve S. Bjørset and Anne Hytta are all highly skilled performers, each one with a strong individual sound. With musical heritage from the regions Hardanger, Sunnfjord and Telemark, all three of them have done several recordings both as soloists and as band musicians. 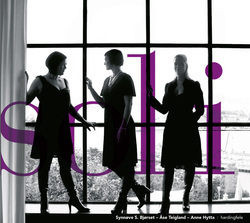 The CD named Soli (Solos) is very much characterized by the girl’s distinct expressions, but is also demonstrating their common feel for the music. 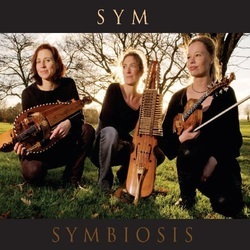 SYM performs fresh, original music rooted in Scandinavian and Celtic folk traditions played on beautiful instruments with sympathetic strings; Norwegian hardanger fiddles, Swedish nyckelharpas and hurdy gurdy. Clare Salaman: hardanger fiddle, nyckelharpa and hurdy gurdy, Eléonore Billy: nyckelharpa and hardanger fiddle, Anne Hytta: hardanger fiddle. The album Solaris is chamber folk music that arises at the point where the old and the new meet, generating its own natural musical idiom. This music is distinctive and liberating, and has a tonal vocabulary that will appeal to a broad audience. Anne Hytta has composed most of the music, and Sigrun Eng also contributes with one composition. The album is produced by Andreas Mjøs and is mastered by Helge Sten. dag, kveld, natt (day, evening, night) – album containing three landscapes of sonorous sounds from the Hardanger violin. Dag, kveld, natt is the solo debut album of Hardanger violinist Anne Hytta from Sauland in Telemark, in the south eastern part of Norway. The bright light – day, the shadows – evening, and the dark – night, is represented on the record through three different ways of tuning the fiddle, which illuminate different harmonies and sounds. A diverse record with tunes from Telemark is the result, tunes Anne Hytta has learned from fiddlers in her home valley.